Cynthia joined the UWB faculty in Fall 2014. She received her B.S. in Conservation Biology from the University of Maryland-College Park, Ph.D. in Ecology and Evolutionary Biology from Yale University, and was a postdoctoral researcher at the University of Florida and University of Washington-Seattle as a NSF Math and Biology fellow. Her research investigates 1) what is the role of abiotic and biotic factors on plant diversity patterns over time, 2) why is this diversity important to ecosystem function, and 3) how will these plant communities respond to global change? 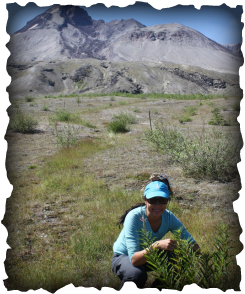 To answer these questions, she has conducted research in tallgrass prairies at Konza Priarie LTER (Kansas), and now works on understanding plant succession on Mount St. Helens volcano (Washington), as well as applying ecological succession theory to restoration at the UWB North Creek wetlands. Cynthia teaches Introduction to Biology (BBio180 lecture and lab) and Plant Ecology, and her classes emphasize hypothesis-driven scientific thinking and active learning. I graduated from UWB with a degree in Biology and have been working at UWB since. I joined the Chang Lab in the Fall of 2017 and I am currently working on a project that focuses on how Arabidopsis react physically and genetically when they are drought stressed. You can usually find me in the lab or in the greenhouse looking after the plants. In my free time, I like to eat new foods, hang with my friends, and exercise. I am currently a Junior at UWB majoring in Biology with a minor in neuroscience. My interests lie within the field of Entomology and seeing as insects and plants often go hand in hand, joining the Chang lab just made sense. Since joining in Summer of 2016 I have aided Dr. Chang in her community assembly studies on Mount St. Helens and have also begun my own study involving spider communities on the mountain. In autumn 2017, with Dr. Chang's help I was selected for the Mary Gates Research Scholarship in with which I will fund my project in summer 2018. Outside of school I enjoy hiking, reading, gaming and making digital art. I am currently a second year at University of Washington Bothell hoping to major in Biology. I have always been interested in everything science, especially plants and the environment! During my first year here at UWB, I was able to recieve the opportunity to take many environmental science and biology classes, which had just further fueled my interest in learning more about the natural world. The moment I heard about Dr. Chang's research, I immediately knew I wanted to be a part of the Chang lab. Currently, I am working with Dr. Chang to research epigenetic modification and phenotypic plasticity in plants in response to stressed and variable conditions, in hopes to gain deeper insight as to how plants adapt, especially in face of climate change. I am a senior at the University of Washington-Bothell with a major in biology and a minor in chemistry. I was introduced to Dr. Chang’s research in the fall of 2017 after taking the investigative biology course with her. After beginning research with her, I knew I wanted to continue and see the whole project through. I am excited to continue working with Dr. Chang and my fellow classmates. In my free time, I enjoy spending time with my family, friends, and volunteering. I am a senior at the University of Washington-Bothell with a major in biology and a minor in chemistry. In Fall of 2017, I was one of the students that collaborated with Dr. Chang to investigate phenotypic plasticity in relation to anticipated climate change. With hopes of working in pharmaceutical research in the future and my love of the research done in fall, continuing research with Dr. Chang was a no-brainer. In my free time, I attend live music events, watch more football than any one individual should, record podcasts and spend time with my family. I am currently a senior at the University of Washington-Bothell finishing up my Biology major. I am interested in continuing the research with Dr. Cynthia Chang started in Fall of 2017. From this study, I am seeking to improve my data and graph analysis skills along with satisfying my curiosities about plant ecology. Our project looks specifically at how different genotypes of Arabidopsis thaliana respond to various environmental constraints. We can then contribute our findings to information to help answer a more broad question: how do plants respond to global climate change? My hobbies are yelping, reading, listening to music, cooking (recently), volunteering, using computers. I am currently a senior at the University of Washington-Bothell finishing up my Bachelors of Science in Biology. I am continuing the research with Dr. Chang from Fall 2017 as I am very interested in learning more about plant ecology. Our project looks at how plants respond to global climate change. In our set up, we look at how Arabidopsis thaliana respond under consistent and inconsistent watering schedule. In my free time, I love to hike, spend time with family, eat delicious food, explore new places and staying outdoor.